This new smartphone by Nokia rouse a wave of discussions because it is the first device with megapixel camera available in mass sale. But besides the camera there is a list of improvements in comparison with other models made by the company (now we talk about smartphones) and the general public has no clue about them. We will consider all the capabilities of the model including those being known and new ones in this review. You can also read about the megapixel camera in a separate report. 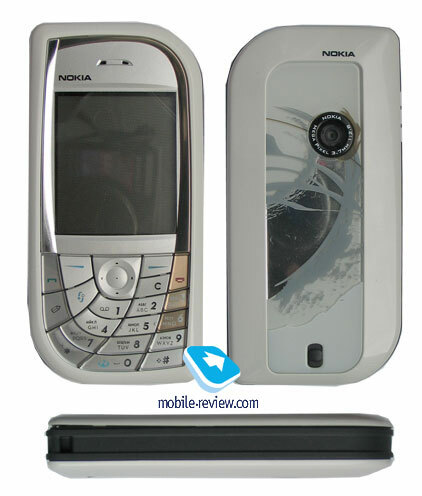 The design of Nokia 7610 is really elegant and uses ideas put in other devices, the model looks very attractive. Considering rounded drop-like corners it may seem that Nokia 7600 had influenced this phone a bit, the polish of the plastic is accordant to other fashion phones manufactured by the company. The phone is produced in two colors (milk-white, red), both look interesting. The light device is not as designing as the dark one. It is impossible to say what gender each color solution is focuased to, they can be referred to unisex. The designers foresaw changeable panels and this is the first time that a fashion smartphone possesses this capability. The presence of the panels is an evident advantage, the device can be renewed very easy, returned to original appearance after fall or long usage. The panels do not have any backlashes. The keypad is an element of design in this model and as a result functionality was partly renounced. The keypad is the thing that rouses questions among those who use the model or plan to buy it. As for me it is not right to say that the keypad is uncomfortable, this is a matter of a habit. If compare with Nokia 3650 and Siemens SX 1, the keypad is much more comfortable. And if compare with Nokia 6600, the keypad is a bit worse. The main disadvantage is in the outmost right row, the buttons are not very large and their motion is slender. Discomfort appears when the user presses buttons and enters large texts. There is ablue backlighting and in localized versions (with two languages on buttons) characters may be viewed not in all lighting conditions, the letters of the second language merge greatly. The display in this model is exactly the same as in Nokia 6600 (TFT, 65K). The resolution of the screen is 176x208 pixels (35x41 mm) and it can show up to 8 text lines and one service line. In general the screen is comparable with those in similar devices, it is not bad. The picture looks vivid, the colours are not very bright, a bit muted. Taking into consideration the fact that the interface is made to fit the capabilities of the screen the feeling that there is a lack of brightness and contrast in the picture does not appear. The display is not bad for its segment but it is incorrect to compare it with screens in usual phones. It fades in the sun but nevertheless information remains readable. There is a rubber on/off button on the top end of the device, it is small and hard to press on. On the one hand it prevents from accidental pressing, on the other hand makes working with the phone difficult. First, this construction of the button does not allow to use a possibility of locking the keypad (whatever is told this possibility is realized here, there is no automatic key lock in a standard set, the problem is solved with the help of extra program). Secondly, changing of profiles becomes not so trivial option. On the bottom of the phone there is an interface connector (Pop port) and a separate charging connector near it. There is no stereo output for earphones and you'll have to be content with mono sound via a standard connector. This is a principal position of the company that tries to provide the device for different markets. A camera gap can be seen on the back side, there are no any shutters and the lens is open. This is a disadvantage of the device because when used carelessly (in the majority of cases) the lens gets dirty and scratched. Also back panel has a small mirror and in some way it addresses the device to feminine gender. The size of the phone cannot be called big, it is elegant though a bit long (108.6x53x18.7 mm). The device looks compact due to standard (for this form-factor) width and the same feeling appears while using it. The same may be told about the weight of the model (118 g), the smartphone doesn't weight down a hand. The airiness of the forms psychologically decreases the real weight. 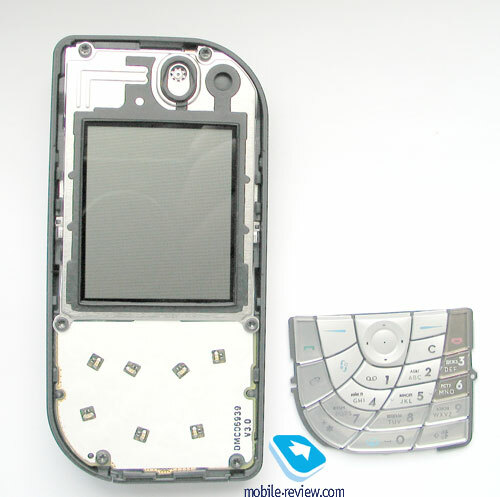 For instance, Nokia 6600 doesn't look so "light" that prepares a user for a big mass. A battery is hidden under the back panel (BL-5C, 900 mAh), and according to the manufacturer it works about 250 hours in the standby mode and up to 3 hours in the talk mode. In Moscow (MTS network) the device worked about 2 days in case of 30 minutes of talk time and up to one hour of using other functions (browser, e-mail, organizer). Full charging time is about 1.5 hours. The model is not a champion in working time but is comparable with the phones of its class. SPMark 04 test package shows the following result for the battery: the total score is 2707, if all the tests are processed (12 hours 9 minutes, 122 cycles). If to consider only 3D test with a game, then working time with maximum backlighting will be 7 hours. The results are comparable with other smartphones made by Nokia. A connector for a SIM and RS-MMC card can be seen under the battery. A card for 64 MB is included into a delivery kit and is enough for the majority of users. Nokia 7610 is one of the first devices with RS-MMC cards. The difference between this card and usual MMC is only in its halved size, a full compatibility with cards of usual size is kept. With the help of an adapter included into a delivery kit RS-MMC turns into a full-size one. In theory it is not very hard to make it possible to use usual MMC cards but then you'll loose the guarantee. General manual to transform the device for using usual MMC cards is the following. You turn back the guiding ways for RS-MMC cards, dismantle the SIM-card connector. Now a usual MMC card can be placed under the battery, but there is no space for a SIM-card. To put in a SIM-card you should detach its chip from a plastic base (you'll need vehicle, tweezers and your luck). In general this all is rather difficult and looks like a brave experiment resulting with the loss of the guarantee for the device. This operation loses sense in the condition of appearing RS-MMC cards of different capacity and price. There are 8 MB of the internal memory and it is not enough for modern applications for today. That is why it is recommended to keep all the possible applications and files on memory cards and if you use several cards it is better to have one permanent. Probably you won't manage to use the device as mp3 player that is why changing cards is unnecessary. Devices based on platform 60 Series run by Symbian 7.0 s have a balanced list of functions, Nokia tried to prolong the life cycle of the platform to the maximum. For that purpose a release of several versions of software called editions was prepared. Beginning with the second edition various software and hardware additions appear, they are called Feature Pack (functional sets). There are only three additions for the second edition - Feature Pack 1, 2 and 3. These editions are mostly for developers and they bring a list of new possibilities for users. 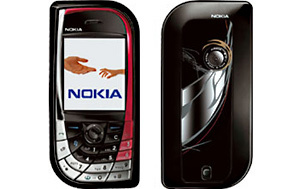 Nokia 6620, 7610, 6260 are the first models with installed Feature Pack 1. It is necessary to understand that all the announced in Feature Pack 1 functions may be not realized in a certain device. Realization of this or that function is the affair of the manufacturer, his positioning of the device and giving it some functionality. Fir example, Nokia 6620 doesn't have a megapixel camera though there is a support for it in Feature Pack 1. Let's describe general parameters of Feature Pack 1 and support for new technologies. EDGE. This expansion of GPRS is undoubtedly an improvement. For the current moment there are not so many networks supporting EDGE but their number will increase monthly in the future. Location. With the appearance of the possibility to locate a terminal in networks manufacturers started installing applications that allow to set the behaviour of the phone (permission for location, permission with a request and etc). The appearance of the function mainly makes easier the lives of the third software developers and provides basic functionality for smartphones. Profiles. A possibility to create profiles from the beginning and set the instant messaging applications (Presence ability) seems an improvement. Megapixel camera. The software supports megapixel camera (1152x864 pixels) possibilities. Java. In the new model JSR-135 version 1.1 is supported. This specification determines Mobile Media API that allows creating applications operating with sound, video and images. Third-party developers get a possibility to create multimedia applications, for example, mp3 players and so on. Browser. The renewal of the browser is rather serious, in particular, a support for HTML 4.01 (a possibility to view usual, not optimized sites) appeared and general productivity is improved. Browser provides full support for wap 2.0. As for the improvements in the interface, we should point out the appearance of horizontal and vertical scroll bars, switching to full screen mode, status bar and a function of filling in the address line (the addresses used earlier may be chosen from a list). Messages. Connection via 995 and 993 ports that is necessary for protected corporate systems appeared (Microsoft Exchange Server). The OMA MMS 1.2 recommendations are fully realized for MMS, that provides full compatibility with other devices. Instant Messaging, Presence. 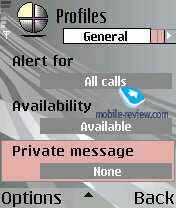 Feature Pack 1 includes a support for OMA Instant Messaging and Presence Service (IMPS) v1.1. We will not describe all the capabilities of the technology, those who are interested may get to know it in the documents for developers. Multimedia. 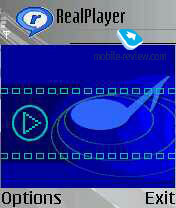 A support for play lists (mp3 and mp4 files) appeared in the player. The file format for a play list is M3U. Multimedia Framework supports two new codes - MP3 and AAC. Today there is no information what Feature Pack 2 will contain, its appearance may be expected in November. Considering the release period of the renewals it is possible to say that 60 platform will remain the same at least during 2.5 years. It is necessary to say that devices with Feature Pack 1 or any other version may have other functions (hardware and software) not described in this specifications. For example, if any of the manufacturers that licensed 60 platform will want to integrate full functional 12-channel GPS receiver they will manage it. And this function will not be concerned with Nokia's specifications for the platform, this will be not a standard solution of the third company. Unfortunately the majority of smartphones' manufacturers have not learned to localize their products well. 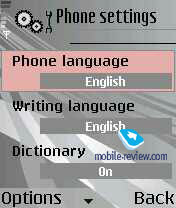 If you use English menu you have no troubles, all the terms are clear and there are no abbreviations. But on switching to Russian you start to doubt if it is a smartphone. It seems, there are no limitations on the size of the screen, memory, there is a possibility to create your own local font-types. But abbreviations follow you almost everywhere, and they are not the best and clearest. There is not unity in abbreviations and that spoils a complete impression made by the device. In English there are such abbreviations as Manager, File mngr, Dev.mgr. As for me, no any uniformity and this is an evident shortcoming of the device. A great advantage of the model is a possibility to choose menu language separately from the input language by default. For example, you set English menu but want to enter data in Russian and it is possible. Even more, pressing buttons one after another you get access to the letters of the second language. Several third-party programs are provided with the phone, they are partly described in the report devoted to the camera. 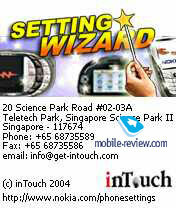 Also I would like to speak about Set up wizard that helps to set wap, GPRS, MMS for your operator. There is data for the majority of the operators in a not very large data base of the program, on start up it determines the network and determine all the necessary settings. This is a very convenient and useful program, it really makes life easier. 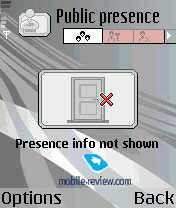 A program called Welcome is some kind of a demonstration clip that shows capabilities of the phone. As for me, having seen it once you may delete it. It is typical that a user not acquainted with smartphones and the principles of their work may get afraid of the warnings that appear when starting a third-party program. As a rule, on the first start up of the program you see a note telling that the program has no relation to Nokia and may work incorrectly. This notification deserves praise as a security measure but it would be better to make an exception for preinstalled programs and not to show this headband. A prepared user will ignore this warning and understand that the program is absolutely legal, a beginner may start thinking and try to find anything in the manual where there is nothing on it. That is why I put forward a supposition that such warnings should be removed if we speak about third-party programs included into a standard package. Basically all above may be considered as small cavils not worth any attention. It is more important that the changes in the interface of the operating system influenced its compatibility with programs written earlier. 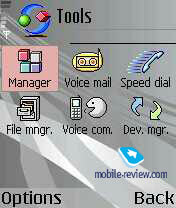 I will remind that Nokia 7610 is run by Symbian 7.0 s, the same operating system is installed in Nokia 6600. It may seem that a program working on Nokia 6600 has to work on Nokia 7610 also. In the reality it is not so. 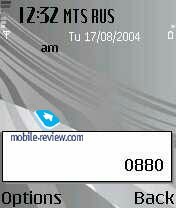 Many programs that may be run on Nokia 6600 do not work on 7610. We didn't manage to find any rule but experience has shown that the majority of system utilities, file managers and so on do work well on Nokia 7610. At the same time programs using graphics actively work correctly not always. This ill-posedness may cause errors while running programs or denial in installing them. Some software manufacturers have already announced that they are going to provide renewed versions of their products for Nokia 7610 and next smartphones. At the same time many of already available programs won't be renewed and it is a great minus. For users all the listed above means additional troubles with search for programs, wasting time on installation and checking their efficiency. Testing package SPMark 04 was used to measure the productivity. The following data was gained, we provide it in comparison with N-Gage QD. Higher frequency of the processor tells on operating speed positively, the device is much faster in all the parameters if compared with the game console. 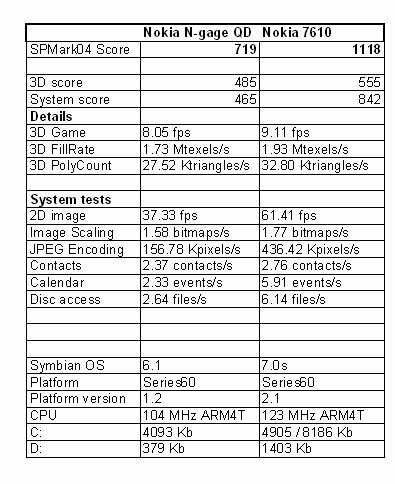 The results gained with the help of JBenchmark (both versions) are rather high and show that the device will work acceptably with the majority of the applications. One shouldn't be afraid that the processor speed will be too low. As for the quality of connection the device rouses no criticism, the phone works well. The volume of the polyphonic call signal is medium and it can be heard in the room but troubles appear in a noisy street. The power of vibrating alert is medium. Also I would like to point out that polyphony still remains a weak point of phones made by Nokia, in this parameter the device loses greatly to Korean phones and models made by Siemens and Motorola. The only way out is to set mp3 melody as a call signal, all the other versions do not seem appropriate (the quality of the sound is acceptable, but not more, mp3 is better). Another weak point is that the device has mono output, this means that it is impossible to use it as mp3 player. Such files can be used only as call signals. At the same time, according to the manufacturer the phone has 48-tone polyphonic call signal that has to sound well. The disadvantages of the call signal are mostly connected with its realization and the quality of the loud speaker. 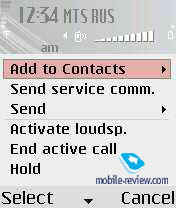 Icons determining signal and battery levels are weaknesses of Nokia 7610. They merge with wall papers (in all the preset themes), that makes them almost unreadable (2 or 3 points). An evident advantage of the phone is the information that appears when the screen saver (moving digital clock) is on, these are icons telling of missed calls, events and messages. Also as a strengths we should point out the presence of megapixel camera with minimum settings, expansion slot for RS-MMC cards (a card for 64 MB is included into a standard kit). The fact that the device is referred to smartphones doesn't matter much for its users. Nokia tried to produce a device in habitual form-factor with megapixel camera and minimum extra possibilities. The camera was considered the peculiarity of the phone and was emphasized by the company. We can see a try to move the demand from business phone segment to fashion one, to redirect the smartphone to another group of users. The try is successful in some kind, because Nokia 7610 is the first device with megapixel camera available widely. On the other hand it is not so unambiguously, as Symbian smartphone the device is not so easy to cope with and a bit slower than usual phones. Its possibilities are seen widely if extra programs are installed and experiments with them were held, and it is barely probable for a target group, the majority of the customers will not do that (the youth is not counted). That is why an interesting refraction appears in the consumer's mind. Nokia 6600 may be replaced with 7610 if you need megapixel camera, extra functionality, compatibility with the third-party programs that you already use. Waiting for Nokia 6630 seems reasonable, the device is planned for the same group of users as Nokia 6600 (the problem with compatibility will remain anyway). For the majority of the customers Nokia 7610 is their first smartphone and that is where all the rest comes from. The company doesn't announce the device as business solution, it is a fashion phone. 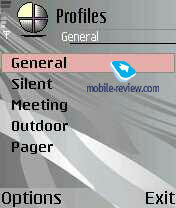 On the other hand the presence of Symbian OS provides great functionality and a possibility to expand it. To sum up I'd like to say that the phone is not bad as a fashion solution, it really attracts attention. In this point the main rival is Siemens SX1. That ambiguous reaction on Siemens SX1 was connected with the fact that many people tried to evaluate it as a smartphone, not a game, entertaining device even with Symbian OS inside. Siemens SX1 has an advantage of stereo output, mp3 player, FM-radio and the disadvantage is a lack of megapixel camera, slower work of interface. As a working tool Nokia 7610 may be used with a list of reservations, the main is a lack of touchscreen, that seems a nonsense for a smartphone equipped with integrated mail client. 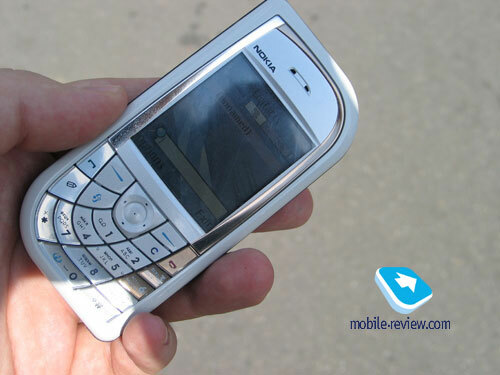 For business users with minimum demands Nokia 6600 remains the best choice, for those who wants maximum functionality it is Sony Ericsson P900, P910. If your purpose is megapixel camera and smartphone, then buying this model seems reasonable for a long time especially if the budget is limited. If the type of the device plays no role then soon a cheaper Siemens S65 will appear (in the end of autumn the prices will be equal). Let me repeat that this smartphone should be chosen as a fashion solution with all the consequences. Nokia's admirers that are not satisfied with all the devices listed above should wait for Nokia 6670. It will possess basic functionality of Nokia 7610, platform 60 version 2.0 and more calm design. Approximately the company will announce the device in September.